End of life massage is just a beautiful gift that a loved one can experience during the process of dying. Making a patient comfortable is so important to help with transition. Here are some tips on finding a massage therapist who is willing to provide this type of service. Start with hospice care. They have a list of volunteers for massage. Keep in mind it may take a while for someone to get sent to the home and it also may not be the same person if there ends up being more than one massage. If you have a regular massage therapist ask him or her. End of life massage can be emotionally difficult for the therapist so you may have to do some asking around. This is all about patient comfort. The massage therapist needs to be able to perform not just on a massage table, but also possibly while the patient is in bed. The intention is to always provide stress relief. People are emotionally drained from not sleeping well and being in pain. Massage can help reduce that pain for a short time. And give the client a much need nap, even if it’s just for 30 minutes. This can also be some much needed down time for care givers as well. It’s a nice emotional check out moment for both caregiver and patient. One of the main reasons for a massage is, chronic pain from being bed ridden is very common. Massage can help get the blood flowing again to those pressure points. Not being able to get up and move freely causes limited blood and lymph flow. This pooling of fluid creates pain. A gentle massage on someone’s hands and feet can make all the difference in the world. It’s even wonderful for someone to be touched by someone other than a nurse and or doctor. This give the dying loved one a chance to re connected to their body and on a cellular level get ready for death. 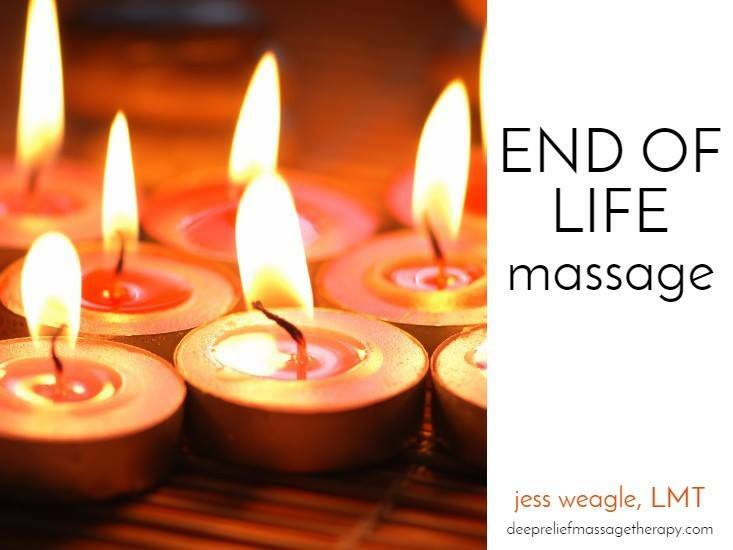 End of life massage is all about providing someone with that extra loving touch. Give a person a chance to forget they are dying for a few precious moments. If you are searching for this service in the West Boylston, MA area, this is a massage I love to provide. I get a lot of joy helping someone who is dying a few minutes of peace in their body. Just use the contact form below to set up a time and ask about prices.